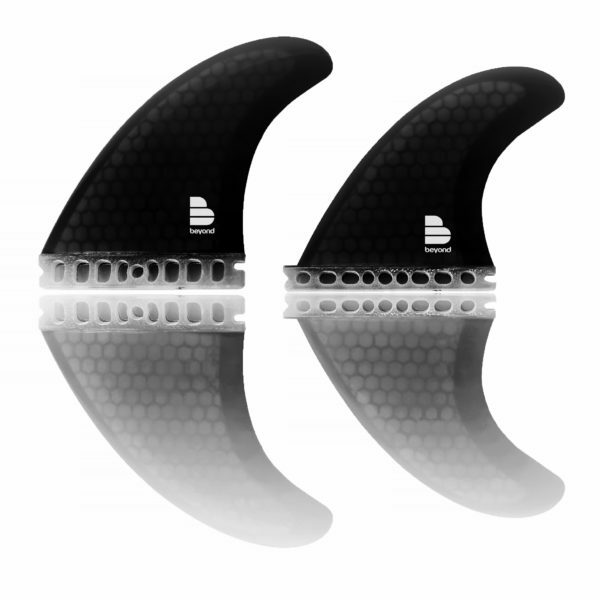 Beyond HI-ASPECT Quad Flexcore Fins- Futures compatible as a modern classic. The Beyond® QUAD HI-ASPECT sets for Futures in DEEP BLACK. Designed for extra long lines from Twinnies, Fish and modern surfboard designs, with a slightly higher aspect for enhanced drive, but with easy transition if required. 20% foiled inners, and 80% easy-foiled outers give noticeable speed and less drag, especially over V tails and lightly concave bottoms. Futures base, FCS base also available. A very modern design in unique DEEP RED fibreglass over our Flexcore base. The glass has to be super clean, and finished perfectly to get this effect. Also available in Deep Red, Purple, and in pure, unadulterated Volan. The Beyond® QUAD HI-ASPECT fin set for Futures in DEEP BLACK. Designed for extra long lines from Twinnies, Fish and modern surfboard designs, with a slightly higher aspect for enhanced drive, but with easy transition if required. 20% foiled inners, and 80% easy-foiled outers give noticeable speed and less drag, especially over V tails and lightly concave bottoms. A very modern design in unique DEEP BLACK fibreglass over our Flexcore base. The glass has to be super clean to be finished perfectly, and is tinted with limited compromise to the flex or design. Also available in Deep Red, Purple, and in pure, unadulterated Volan. Also available in an FCS base – in limited quantities.